We’d love your help. Let us know what’s wrong with this preview of Silent Suspect by Kerry Wilkinson. It started with a phone call. Just one word – ‘Jessica’ – and now Detective Inspector Jessica Daniel has a big problem. Her missing friend, Bex, called from a battered seaside payphone and yet, by the time Jessica arrived, there was nobody there. Jessica believes someone must be framing her. Someon It started with a phone call. Just one word – ‘Jessica’ – and now Detective Inspector Jessica Daniel has a big problem. Jessica believes someone must be framing her. Someone who is always a step ahead. When she finds a boy whose tattoo matches Bex’s, she becomes more desperate than ever for answers. But, with the police growing more suspicious, Jessica doesn’t have long to find Bex before she becomes the prime suspect for a murder. To ask other readers questions about Silent Suspect, please sign up. I love the Jessica Daniels series but the premise here initially made no sense to me. It starts right after the ending of book 12, in which Jessica gets a phone call from Bex, who had disappeared from Jessica’s house months before without any of her belongings, including her phone or purse. When Jessica goes to check out the location of the phone call, a phone box in Blackpool, she sees a missing person poster on the phone box and calls the number. And I’m thinking really? But I should have trusted Wilkerson to bring it all together in the end. Because this takes place in Blackpool, Jessica is on her own. And I missed the team. A big part of my love of this series is the interaction and banter between the team members. But it was fun to see Wilkerson bring Andrew Hunter into the mix here. Setting aside that I was initially suspect of the premise that started the story, the book moved along at a good clip and kept me engaged. It is interesting to watch Jessica on the other side, as suspect rather than police. So, once again Wilkerson does it. Another strong entry in the series. This is the 13th book in the Jessica Daniel series by author Kerry Wilkinson. I have ready many books by this author but surprisingly this is the first one I have read in this long running series and can easily be read as a standalone without spoiling any enjoyment. Jessica is alone in Blackpool looking for her missing friend Bex after tracing the last phone call she received off Bex to a phone box in Blackpool. She takes holiday from work to make her own investigations that get her into trouble This is the 13th book in the Jessica Daniel series by author Kerry Wilkinson. I have ready many books by this author but surprisingly this is the first one I have read in this long running series and can easily be read as a standalone without spoiling any enjoyment. Jessica is alone in Blackpool looking for her missing friend Bex after tracing the last phone call she received off Bex to a phone box in Blackpool. She takes holiday from work to make her own investigations that get her into trouble of her own. Very soon she is talking to the Police about a murder she appears to be connected to, when a person she is linked to is murdered. Jessica troubles go from bad to worse but is helped by a new group of friends she makes while away from home. I liked enough of this book to make me want to read more of the series and will continue with it when I get through my mountain of books to read. I really enjoyed this one even though maybe a little hard to believe at times, but don't let that spoil a good story. I've said before that while I truly enjoy this series, I never totally warmed up to the main character, detective inspector Jessica Daniel, until Book 12 (this is the 13th). In that one she won me over, and after reading this one I remain a fan. She's a tough-as-nails, no-nonsense woman whose background issues don't get in her way - well, most of the time, anyway. As this one begins (thanks to the publisher for an advance review copy) Jessica has received an ominous phone call from her wayward yo I've said before that while I truly enjoy this series, I never totally warmed up to the main character, detective inspector Jessica Daniel, until Book 12 (this is the 13th). In that one she won me over, and after reading this one I remain a fan. She's a tough-as-nails, no-nonsense woman whose background issues don't get in her way - well, most of the time, anyway. As this one begins (thanks to the publisher for an advance review copy) Jessica has received an ominous phone call from her wayward young friend Rebecca ("Bex"), who had been living with Jessica but recently disappeared with no warning. Jessica leaves Manchester, where she works and lives, to try and find her on a beach some 50 miles away. There, she notices a "missing" poster showing a young girl named Katy, who bears a strong resemblance to Bex. When Jessica calls the number on the poster, the man who answers claims to be Peter, Katy's brother. They meet in person, but Peter has no knowledge of Bex. Disappointed, Jessica returns to her rather seedy motel room and single-handedly empties the mini-bar's contents (well okay, maybe she used both hands). When she crawls out of bed - pretty thoroughly hung over - she gets a sobering wake-up call; the man she met has been murdered. Not only was she the last known person to have seen him alive, there's blood on her car that wasn't there the day before. The local police detective is willing to cut her some slack because she's "one of them," but at the same time, she's considered a prime suspect. From that point on, it's mostly Jessica trying to stay in the shaky good graces of the law despite mounting evidence of her guilt while continuing to look for Bex on her own. The journey takes her to the bowels of the city she's in - almost literally - and reveals some nasty goings-on involving drug and human trafficking. Needless to say, Jessica lives to see another day (or more to the point, another book), although she doesn't emerge totally unscathed. Interesting to me is the author's explanation that the series has been developed to showcase "seasons" of Jessica's life; books 8-13 are Season 2, which means the next one will mark the start of Season 3. What do I say to that? Bring it on! Silent Suspect is the thirteenth book in the Detective Inspector Jessica Daniel series and is a thrilling, heart-pounding read. From page one, it's a tension-filled, intense and high-octane rollercoaster ride, and at certain points, I found my jaw on the floor. I was in its grip rapidly and not released until it was all over. It held my attention a little too well, but that certainly isn't a complaint! Wilkinson's characters are almost always real and relatable, and here they are well developed. Silent Suspect is the thirteenth book in the Detective Inspector Jessica Daniel series and is a thrilling, heart-pounding read. From page one, it's a tension-filled, intense and high-octane rollercoaster ride, and at certain points, I found my jaw on the floor. I was in its grip rapidly and not released until it was all over. It held my attention a little too well, but that certainly isn't a complaint! Wilkinson's characters are almost always real and relatable, and here they are well developed. However, their motivations and decisions are flabbergasting to me. The story is a far-fetched one, but isn't that what fiction is for? I guess the answer to that is dependent on individual preferences. There are a few interesting twists and turns throughout that propel the story forward, and main protagonist, Jessica, is as tenacious as ever and her no-nonsense approach ensures she gets the results she wants. Each of these books can be read as a standalone, but it's beneficial to read them from the beginning and in chronological order to see how recurring character evolve and grow. This is #13 in the Jessica Daniel series, but my first read in the series. I thoroughly enjoyed this novel and would go back and read all the Jessica Daniel books. I feel like there was not spoilers from the previous books, it really stuck to the story at hand. I really loved Jessica Daniel’s character, she was a very likable and strong character. She’s a Detective Inspector, so this could be classified as a police procedure, but this particular book wasn’t since she was the suspect. She had to This is #13 in the Jessica Daniel series, but my first read in the series. I thoroughly enjoyed this novel and would go back and read all the Jessica Daniel books. I feel like there was not spoilers from the previous books, it really stuck to the story at hand. I really loved Jessica Daniel’s character, she was a very likable and strong character. She’s a Detective Inspector, so this could be classified as a police procedure, but this particular book wasn’t since she was the suspect. She had to try to clear her name, there was quite a lot of action as well in this book, which I really enjoyed. It wasn’t a “edge of my seat thrill ride” but it was still very good, and I was captivated all the way through. So far, I’ve read two books by Kerry Wilkinson and I will read many more! Highly recommend. Creepy. Psychologically Thrilling. Deeply moving. This has it all and Kerry has plenty of twists and turns for readers of all ages. Bex called Jess from a dark and dirty seaside pay phone but when Det. Jess went searching for her friend nothing existed. Now she feels framed and for good reason. The one and only person claiming to help Jess was found stabbed to death. Clearing her name and finding her friend safe and sound is all she asks, now that can't possibly be that difficult right? W Creepy. Psychologically Thrilling. Deeply moving. Well, read on and fall in love with this thriller. Thank you to Kerry, Bookouture, NetGalley, and Aldiko for this ARC in exchange for this honest review. I would like to thank Netgalley and Bookouture for an advance copy of Silent Suspect, the thirteenth novel to feature DI Jessica Daniel of Greater Manchester Police. When Jessica traces a call from her missing friend Bex to a call box in Blackpool she heads over there to try and find her but things start to go wrong when Peter Salisbury who offers to help her is found stabbed to death hours after meeting her. She doesn’t have long to find out what’s happening before she’s arrested for murder. I th I would like to thank Netgalley and Bookouture for an advance copy of Silent Suspect, the thirteenth novel to feature DI Jessica Daniel of Greater Manchester Police. I thoroughly enjoyed Silent Suspect which is an elaborately plotted thrill of a read with some really tense moments. I found myself hooked and actually had to put the book down at certain tense moments for some breathing space. It’s a sign of good writing when the reader identifies so closely with the characters and their predicament. The plot has some good twists and turns but overall I found it failed the credibility test and seems like a sequence of very good scenes cobbled together into a less than convincing whole. I struggled with the characters’ motivations and actions, none of which except Jessica seem realistic. I could give some concrete examples but don’t want to issue spoilers. Jessica is Jessica, highly motivated to get a result, in this case finding Bex. It is interesting to see her on her own rather than as part of a team but despite her lone wolf status she still manages magnificently. This series just gets better and better! I think anyone who read book 12 in this series couldn’t wait for book 13 as we were left hanging on wanting more after Jessica received a phone call from her missing friend Bex at the end of the book. We find Jessica leaving her team in Manchester and setting off to Blackpool to try and find Bex. She had traced the call to a phone box and on investigating sees a missing person poster for another girl with a telephone number on it. This sets Jessica on a d This series just gets better and better! I think anyone who read book 12 in this series couldn’t wait for book 13 as we were left hanging on wanting more after Jessica received a phone call from her missing friend Bex at the end of the book. We find Jessica leaving her team in Manchester and setting off to Blackpool to try and find Bex. She had traced the call to a phone box and on investigating sees a missing person poster for another girl with a telephone number on it. This sets Jessica on a dangerous path. After ringing and meeting this man, giving him her card, she is greeted the next day by the police at her door as the body of this man has been found with her card on him, so now Jessica finds herself as a chief suspect in a murder enquiry and her own life in danger. Can Jessica continue to seek out her friend and clear her name at the same time without her team to back her up? She meets up with Fran and a close group of women who she has to turn to for help and also a ‘familiar face’ turns up to give assistance. This is a fantastic read and had me completely hooked. It is a gripping thriller that will have you worrying for Jessica and her friends safety. A highly recommended read. I will have to be patient for book number 14! Events are piling up in this fast-paced book. You seem to be in a small canoe being dragged away with the current of this raging river. At the moment you think that last whirlpool will be the end of it, there is the rescue Three cheers for the author because he has done it again. I opened this book (I had been wanting to read it so badly since I last the previous part) and I was lost straight away. It felt like I had been given a slap on the back and I fell, head first into this brilliant story. This is a fantastic series that I highly recommend. In this book Jessica is on her own in Blackpool, looking for Bex. Book 12 ends with Jessica receiving a phone call from Bex and she traces it to a phone box in Blackpool. She takes some leave from work and starts her own investigation which lands her in deep trouble. Before she knows it, she’s ‘helping the Police with their enquiries’ as a person she spoke to ends up murdered. Jessica is in a strange place and has no-one to turn to until she me This is a fantastic series that I highly recommend. Jessica is in a strange place and has no-one to turn to until she meets Fran who has a close group of friends that Jessica immediately warms to. Things go from bad to worse for her and soon she has to ask her new group of friends to help her. I won’t say any more as I don’t want to spoil it for you but I can say this is a fantastic story and one which will have you on the edge of your seat. Hard to believe this is the 13th book in the Detective Jessica Daniel series and it is every bit as fresh as the first. Silent Suspect grabs you from the get go. Jessica has pulled in some favours to trace the call she received at the end of book 12. It came from a phone box on the south shore in Blackpool and as this is the only lead to finding her friend Bex Jessica heads straight there. She locates the call box and discovers the poster of another missing girl.The girl Katy looks a lot like Bex, Hard to believe this is the 13th book in the Detective Jessica Daniel series and it is every bit as fresh as the first. She locates the call box and discovers the poster of another missing girl.The girl Katy looks a lot like Bex, could the disappearances be connected ? In order to discover more Jessica phones the contact number and gets through to the girls "brother" Peter. They meet up to talk and compare information , however Jessica has an uneasy feeling about Peter. After booking into and spending the night in a seedy hotel opposite the phone box Jessica is awoken to the news that the man Peter has been found murdered, not only was she the last person to see him but blood has appeared on the bumper of her car. Although the local police have her down as a prime suspect because of her being "one of them " they cut her some slack and she continues to try to trace Bex whereabouts. How long will she manage to continue as the evidence against her mounts, will she clear her name and dicopver the identity of the murderer and reach her ultimate goal of finding Bex. Plenty of twists and turns in this one as the storyline moves along at a furious pace. This is a story of what happens when Jessica is on the other side of the law? I enjoyed this fast-paced, suspenseful story and look forward to the next book in this series. I thank Netgalley for the opportunity to read and review this book. Thirteen outstanding books in a series has to be a record of some kind, no?!! God, I can't wait for number fourteen! Jessica Daniel is one of the best detective characters ever written. With the way that book 12 ended I have been chomping at the bit to get my hands on this book as I'd heard that it marks the end of season two for Jessica and promises to wrap up the season thread that has been present throughout. But as I started it, I soon wondered if this time Jessica had bitten off more than she could chew. Obviously it is always best to read a series from the start and in order and with this book, it is especially important as it does wrap up things that have gone before but With the way that book 12 ended I have been chomping at the bit to get my hands on this book as I'd heard that it marks the end of season two for Jessica and promises to wrap up the season thread that has been present throughout. But as I started it, I soon wondered if this time Jessica had bitten off more than she could chew. Obviously it is always best to read a series from the start and in order and with this book, it is especially important as it does wrap up things that have gone before but, for those who haven't been with the series since the beginning, there is enough catch-up to make sense, even if you won't quite get as full an impact to everything that goes on. I've been with this series since 2011 when it was first self-published and have read and enjoyed every book released. I've also enjoyed this author's Andrew Hunter series as well as all his stand alones. You could say I am a bit of a fan! There is something so comfortable about the style he writes in. His humour shines through with all the wonderful one liners and observations he pops into the narrative every so often. He also uses the place in which he sets his books almost like a character in its own right, something I especially loved in this book as I am more familiar with the area he used. Couple that with well described, real characters playing out some very well plotted stories and you have the complete package with every book he releases. Time for the latest installment of the Jessica Daniel crime series. Ive said repeatedly this is my favourite series and book 13 which may be unlucky for some is definately not on this occasion. This is by far the best in the series and sets out to wrap up "Season 2". Book 12 Eye for an Eye ended with the one word "Jessica..." on the phone from the missing Bex before the phone line cut out. Silent Suspect starts with Jessica having pulled in some favours and traced the phone call to a phonebox on t Time for the latest installment of the Jessica Daniel crime series. Ive said repeatedly this is my favourite series and book 13 which may be unlucky for some is definately not on this occasion. This is by far the best in the series and sets out to wrap up "Season 2". Silent Suspect starts with Jessica having pulled in some favours and traced the phone call to a phonebox on the South shore of Blackpool (where this whole book is based - a change from the previous books being based in Manchester). This is a very fast moving book which takes Jessica out of her comfort zone into the underground world of the homeless and also touches on some other issues which i won't mention due to spoilers. I would say the book can be read if you haven't read the series, however I would urge you to do so as it will greatly help you understand the complex characters of Jessica and Bex. I particularly liked hearing the latest in Jessica's 'guide to being Northern' in the guise of her opinion on how to eat chips after having been treated to her thoughts on sauce on bacon sandwiches in a previous volume. If i had to find a fault, i would say that the bad guys plan seemed to rely on a lot of luck in Jessica acting how they wanted her to, although there was kinda a reason they would know how she would behave. Thats just a minor problem though and frankly forgotten when you think how good this book is. I cant format the text on this review, but if this were the days of MySpace (for the kids out there, thats a site everyone used before Facebook) i could I would put the two words "BUY IT" in big red flashing sparkly letters! It really is that good. It started with a phone call. With just one word: ‘Jessica’ - and now Detective Inspector Jessica Daniel has a big problem. Her missing friend, Bex, called from a battered seaside payphone and yet, by the time Jessica arrived, there was nobody there. One man claims he can help – but then he turns up on a beach stabbed to death. Jessica believes someone must be framing her. Someone who is always a step ahead. When she finds a boy whose tattoo matches Bex's, she becomes more desperate than ever for answers. But, with the police growing more suspicious, Jessica doesn’t have long to find Bex before she becomes the prime suspect for a murder. I really enjoyed seeing Jessica step away from the office and the complete change of environment for her in this book. Her search for the elusive Bex is fraught with mystery and red herrings that just more frustrating with each turn of the page. Kerry Wilkinson winds the tension ever tighter with each and every chapter as Jessica's clue's towards Bex's location turn quite literally into dead ends. As Jessica seeks help from a character seen in previous novels, it feels good to revisit that character interaction with Jessica. The police are on her tail and she needs someone she can trust. Typically, the author's character detailing is second to none and his description of the environment, both the city and the rural landscape is stunning. I could almost feel the earth beneath my hands as Jessica was scrambling around. She's been searching for months, and when Jessica finally receives a phone call from Bex, the only word spoken is, "Jessica." It takes Jessica two days to trace the call to a west coast pay phone in Blackpool. Taking some long overdue time off, Jessica heads there immediately hoping to find Bex but ends up in a disaster of the sort that involves Jessica being accused of murder. This is quite the complicated plot featuring all sorts of dastardly goings on and many interesting characters -- both good guys and bad guys. NO SPOILERS. Since the ending of #12 was a cliffhanger, I jumped at the chance to continue the story arc and sat down to read this immediately after receiving approval for the ARC today. It's so fast-paced, absorbing and full of action that I found it impossible to put down and thus read it in a couple of hours. This isn't a typical Jessica Daniel police procedural as she's gone off on her own without her team into Blackpool and is operating in a sketchy area and hooking up with an unusual group of women. Her main mission -- to find Bex -- leads her into a huge network of criminal activity and puts her career and her life in serious danger. It's great writing and storytelling and I'm so happy that this series just keeps getting better. I've read all of them and can't wait for the next hoping only for the best for Jessica. I'll be eager for her to return to Longsight Police and am wishing for Jessica to find some peace and contentment in her personal life. ***And something really fun and special -- an appearance in this book by Andrew Hunter, the private investigator protagonist of another Kerry Willkinson series! What can I say? I'll start with this, this is a thrilling rollercoaster ride of a book, buckle up and get ready for it. I've loved this series from the beginning, Detective Inspector Jessica Daniel is a stubborn strong minded woman who has been through the mill both personally and professionally but she always comes out fighting. If you've read the 12th book you'll know that at the very end of it Jessica receives a phone call from her friend Bex who has been missing for about three months saying What can I say? I'll start with this, this is a thrilling rollercoaster ride of a book, buckle up and get ready for it. I've loved this series from the beginning, Detective Inspector Jessica Daniel is a stubborn strong minded woman who has been through the mill both personally and professionally but she always comes out fighting. If you've read the 12th book you'll know that at the very end of it Jessica receives a phone call from her friend Bex who has been missing for about three months saying only one word 'Jessica'. Immediately taking some leave from work she dashes off to Blackpool to try to find her. After calling in favours the call was traced to a tatty phone box. in front of a row of dilapidated buildings and a rather seedy looking hotel. Once she finds the phone box she sees a poster for another missing girl called Katy who has a strong resemblance to her missing friend. After she calls it and arranges to meet Peter Salisbury who she thinks is Katy's brother, they meet and swap information, but she really doesn't trust him and as could only happen to Jessica he promptly turns up murdered the next day. Thankfully the police are treating her decently as a fellow officer even though they have her down as a suspect. This allows her to continue her search for Bex, which seems to be one dead end after the other until she meets Fran and an unlikely band of friends. 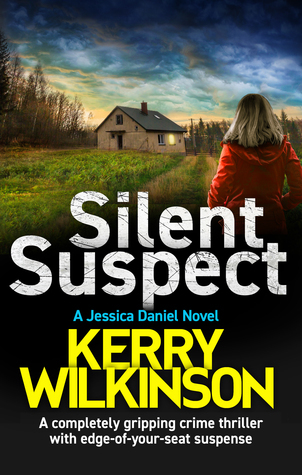 Silent Suspect by Kerry Wilkinson is the 13th installment in Wilkinson's Jessica Daniel series. Jessica's friend Bex has been missing for three months when she gets a phone call and the only word spoken is "Jessica" before the call ends. But it is Bex's voice. The call is from a public phone booth in Blackpool, and as soon as Jessica traces the call, she is off to the seaside town in search of Bex. Things get strange as soon as Jessica locates the phone booth and sees a poster of a missing young Silent Suspect by Kerry Wilkinson is the 13th installment in Wilkinson's Jessica Daniel series. Jessica's friend Bex has been missing for three months when she gets a phone call and the only word spoken is "Jessica" before the call ends. But it is Bex's voice. The call is from a public phone booth in Blackpool, and as soon as Jessica traces the call, she is off to the seaside town in search of Bex. Things get strange as soon as Jessica locates the phone booth and sees a poster of a missing young woman who is similar in appearance to Bex. She calls the number on the poster and agrees to meet a man who says the missing girl is his sister. On meeting the man, Jessica feels a little uncomfortable and no further in her attempt to locate her friend. The next morning, she is awakened by police. The man she met with has been found dead on the beach. Now Jessica is not only still searching for Bex, but is a suspect in the man's death. An interesting side story includes Jessica seeking help from Andrew Hunter, the PI in another series by Wilkinson. Other than the help from Hunter, Jessica is cut off from her home base of Manchester and her friends on the force. Her search for Bex has led her into complex criminal activity and an attempt to frame her for murder. As is becoming the norm when Kerry Wilkinson releases a new instalment of the Jessica Daniels series it kept me up all night to finish it in one sitting, I am never able to put these books down and this one was no different, with the last book leaving us on a cliff hangar with the phone call from Bex, this book follows up on that lead with Jessica having traced the call to Blackpool. This was a more personal book than usual, with Jessica trying to track down and ensure Bex is safe, they have an As is becoming the norm when Kerry Wilkinson releases a new instalment of the Jessica Daniels series it kept me up all night to finish it in one sitting, I am never able to put these books down and this one was no different, with the last book leaving us on a cliff hangar with the phone call from Bex, this book follows up on that lead with Jessica having traced the call to Blackpool. This was a more personal book than usual, with Jessica trying to track down and ensure Bex is safe, they have an unusual relationship, not mother/daughter, not friends but an understanding and then she upped and just left one day, no note, no clothes taken, hardly surprising Jessica was at her wits end as to what happened to Bex, was she ok, did her past catch up with her? The tracking of Bex to Blackpool puts Jessica under suspiscion of murder with her being the main suspect, Jessica has to go under the radar to clear her name and discover what and who did murder the man she met, can she do this and will it lead her to Bex? Loved this book although to be fair I am quite biased when it comes to this series, I devour them, with plenty of twists and turns, a gripping mystery to get your teeth into, if you're a fan of the Jessica Daniels series, you will not want to miss this! hank you to Netgalley, the Publisher and the Author for the opportunity to read this book in return for a review based on my honest opinion. I love the Jessica Daniel series. Although this book is the 13th book in the series, it would be quite enjoyable as a stand-alone book as well. but I think that anyone reading this book would seek out the others anyway. Jessica is a great character and I have enjoyed seeing her grow and solve all these great cases. This case puts her in an unfamiliar town an hank you to Netgalley, the Publisher and the Author for the opportunity to read this book in return for a review based on my honest opinion. I love the Jessica Daniel series. Although this book is the 13th book in the series, it would be quite enjoyable as a stand-alone book as well. but I think that anyone reading this book would seek out the others anyway. Jessica is a great character and I have enjoyed seeing her grow and solve all these great cases. This case puts her in an unfamiliar town and it was different just seeing her on her own without her coworkers and friend, that being said, I also enjoyed that it was just her for most of the book. I was so pleased to get a preview copy of the long awaited Jessica Daniel 13. I never tire of reading this series. This story follows on from the one word phone call Jessica receives at the end of ‘Eye for an Eye’. The action takes Jessica out of her comfort zone, firstly because it is based in Blackpool, away from the familiar Manchester setting, and also because more than any time in the past Jessica is potentially on the wrong side of the law. If she fails to solve this mystery the end of her I was so pleased to get a preview copy of the long awaited Jessica Daniel 13. I never tire of reading this series. This story follows on from the one word phone call Jessica receives at the end of ‘Eye for an Eye’. The action takes Jessica out of her comfort zone, firstly because it is based in Blackpool, away from the familiar Manchester setting, and also because more than any time in the past Jessica is potentially on the wrong side of the law. If she fails to solve this mystery the end of her career could be the very least of her worries. As always, the pace is fast flowing and the narrative compelling. I really enjoyed the whole book and have already recommended it. Footnote- there are references in the book to a number of incidents and people from Jessica’s past and this inspired me to reread the entire series, refreshing my memory of some of the nuances in the plots I had forgotten over the years. I have appreciated all the books all over again even though I already knew the endings. The latest in the long running Jessica Daniel series see our titular character taken out of her familiar Manchester homeland and being framed for a series of crimes she didn’t commit. Billed as the last in the ‘second series’ of the Daniel story arc, Silent Suspect is quietly one of the strongest offerings in the series to date. Overlooking the fact that that this, the 13th Jessica book, is used to tie up a number of loose ends ahead of the long-awaited third season, Silent Suspect is a splendid The latest in the long running Jessica Daniel series see our titular character taken out of her familiar Manchester homeland and being framed for a series of crimes she didn’t commit. Billed as the last in the ‘second series’ of the Daniel story arc, Silent Suspect is quietly one of the strongest offerings in the series to date. Overlooking the fact that that this, the 13th Jessica book, is used to tie up a number of loose ends ahead of the long-awaited third season, Silent Suspect is a splendid read as a standalone mystery thriller. It affords the reader the view of Jessica on the other side of the law, trying to prove her innocence rather than prove others guilty. It is a plot device which breathes new life into a long running story. I would recommend the novel to both the constant reader and the newcomer alike, although the later may be best served waiting for book 14 as a starting point as Jessica starts afresh. I just love Jessica and was highly delighted to be offered this book as an ARC from Kerry and I started reading it straight away. I must say Kerry’s Jessica novels never fail to thrill me and I love the humour that goes into them! Especially Jessica and her “chippy teas”. This story is quite different from the usual Jessica storylines in that she is on the receiving end of being hunted by the police. She receives a phone call from her old friend Bex and goes up to Blackpool to investigate but wh I just love Jessica and was highly delighted to be offered this book as an ARC from Kerry and I started reading it straight away. I must say Kerry’s Jessica novels never fail to thrill me and I love the humour that goes into them! Especially Jessica and her “chippy teas”. This story is quite different from the usual Jessica storylines in that she is on the receiving end of being hunted by the police. She receives a phone call from her old friend Bex and goes up to Blackpool to investigate but when she arrives there’s no-one there. The story takes on a more sinister side with Jessica being framed for murder. Things go from bad to worse and I did wonder if this was the end of Jessica. Read it and find out. Silent Suspect (Detective Jessica Daniel thriller series Book 13) by Kerry Wilkinson is a page-turner which has Jessica on the run from the law! I enjoy reading the Jessica Daniel thrillers and this book had me anxious for Jessica to find the truth of why she was being set-up and framed for two murders. I won't post spoilers, but the emotional core of this story is heartbreaking. As Jessica is searching for Bex or clues as to what has happened to her, the events begin to become frightening. Jess Silent Suspect (Detective Jessica Daniel thriller series Book 13) by Kerry Wilkinson is a page-turner which has Jessica on the run from the law! I enjoy reading the Jessica Daniel thrillers and this book had me anxious for Jessica to find the truth of why she was being set-up and framed for two murders. I won't post spoilers, but the emotional core of this story is heartbreaking. As Jessica is searching for Bex or clues as to what has happened to her, the events begin to become frightening. Jessica not only has to protect herself from someone who means her harm, but she has to hide while following clues. Although this is number thirteen in a series, it is very easy to understand and follow as a stand-alone book. As an avid fan of the Jessica Daniel series, I waited with baited breath for book 13, and couldn't wait to start it. As usual, I couldn't put it down. I always feel like I know Jessica well, and Silent Suspect is a perfectly timed instalment. Being set outside of Manchester, and with Jessica not offically 'at work', it explores and develops other character traits. I liked the tie-in with Andrew Hunter and that the book ties up a number of ongoing threads in the series. As usual, it's a thrilling As an avid fan of the Jessica Daniel series, I waited with baited breath for book 13, and couldn't wait to start it. As usual, I couldn't put it down. I always feel like I know Jessica well, and Silent Suspect is a perfectly timed instalment. Being set outside of Manchester, and with Jessica not offically 'at work', it explores and develops other character traits. I liked the tie-in with Andrew Hunter and that the book ties up a number of ongoing threads in the series. As usual, it's a thrilling read, with a fast-paced and explosive plot development towards the end. I loved Jessica being on the other side of the law, and the opportunities the plot gave to Jessica for making new friends. Another Jessica Daniel thriller. I've come to love Jessica Daniel, and am forever looking out for the next book in the series. In this book, Jessica is on the wrong side of the law. When Bex, her friend mysteriously disappeared from Jessica's home, she was distraught and helpless. There were no clues to her whereabouts and no sensible explanation of why or where she had disappeared. So when Jessica receives a phone call from Bex which is traced back to Liverpool, she rushea there, only to find her Another Jessica Daniel thriller. I've come to love Jessica Daniel, and am forever looking out for the next book in the series. So when Jessica receives a phone call from Bex which is traced back to Liverpool, she rushea there, only to find herself a murder suspect. An absolute page turner. I love Kerry Wilkinson's characters and she does not disappoint this time either. A great book one I'd easily recommend.